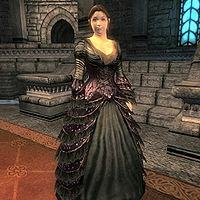 The Court Healer is an Imperial healer who appears in Sheogorath's throne room after the Prince of Madness quest is completed. On command she will cast a spell called "Powerful Healing" on you that restores 20 points to all your attributes for 5 seconds, 100 points to your health and magicka for 5 seconds and also cures disease and poison. The Court Healer can be defined as sedentary, as she does nothing but stand around all day near Haskill until called upon for her healing skills. She does not sit down, walk around, eat, or sleep. However, she does cast "Powerful Healing", both on command and when the player "dies" under the effects of Sheogorath's Protection and is teleported to the palace. Whenever you talk to her, the healer with greet you with "Are you injured, Lord? Do you require my services?" and respond with either "Of course, Lord." or "As you wish, Lord." when you answer "Yes" or "No", respectively. Her only possession is her purple finery. The Court Healer's actions are all controlled by scripts. This page was last modified on 20 October 2015, at 06:30.